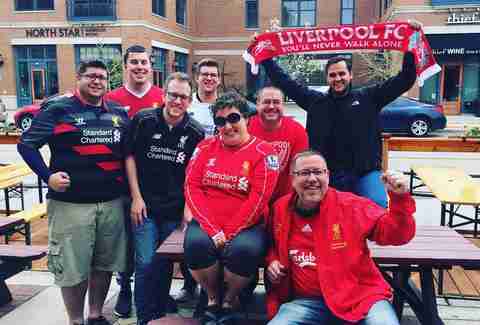 Y ou may not think of Milwaukee as a soccer town, but there are plenty of fans that come out of the woodwork come World Cup time -- even in a year where the US team isn’t playing. It just so happens that a lot of pub owners and employees are fans too, so opening in the wee hours of the morning for a match in, say, Russia isn't so much a chore as something they'd gladly do anyway; might as well make some money while they're at it. 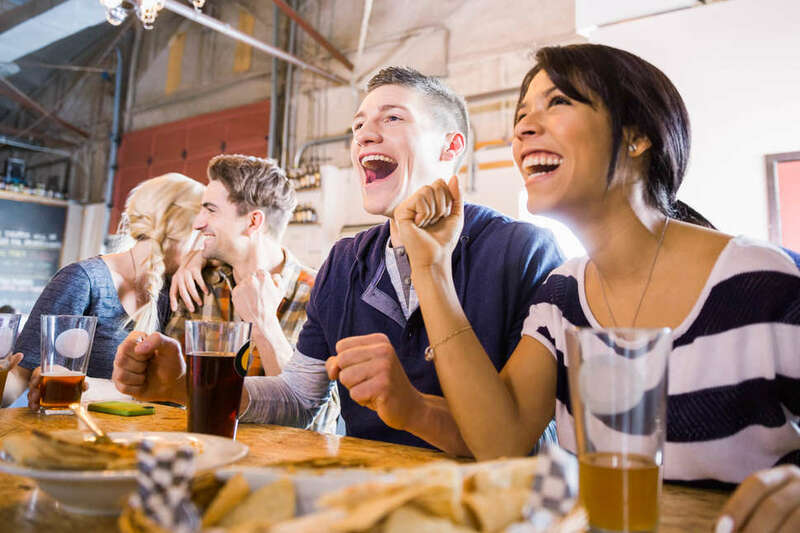 The World Cup kicks off June 14 and run all the way until July 15, which means you’ll have ample opportunity to catch at least a few games -- and we’ve picked out the very best spots in Milwaukee to do just that, whether you're looking for a low-key pub or a raucous World Cup watch party. We'll be sure to update you here with more specials or other details as they get announced. Nomad, the pub on Brady Street, is running a pop-up bar and restaurant in Walker's Point just for the World Cup, and it will undoubtedly be the biggest party in the city. Nomad Nacional has taken over the huge former La Fuente space including its two patios, and are offering a full menu of Latin-inspired food like arepas, tacos, and a frita Cubana sandwich; drinks will be flowing as well, including a Good City Nomad summer ale brewed just for the pop-up. The spot is open already, so scope out your favorite spot now before it gets crazy. What used to be the most raucous World Cup watching spot is now much more low key, thanks to the Nacional pop-up attracting most of the die-hards. 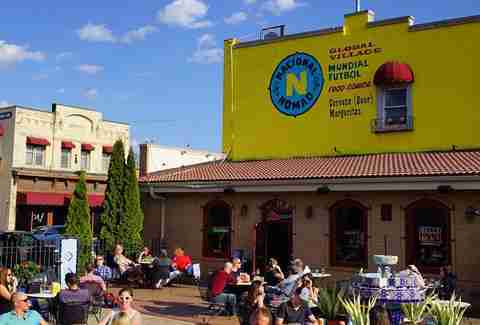 That said, you can bet the original Nomad will still be packed with regulars and fans who don't care if there's a pool table or guacamole. The colorful patio with its outdoor bar is top notch, despite some past World Cup-related controversy. The party usually spills out of the small space and onto the sidewalks, but that's just the Brady Street vibe. Three Lions is likely to have the highest concentration of British accents in Milwaukee at any given time, which means it's probably the highest concentration of soccer fans, too. They're already used to opening at 5am for matches, so the World Cup will be no different. They sport a pretty good menu of local and British favorites, including a full English breakfast for those early mornings. There are two separate bars and a patio, so everyone can spread out. Specials: Free breakfast buffet on weekdays when you purchase a drink. 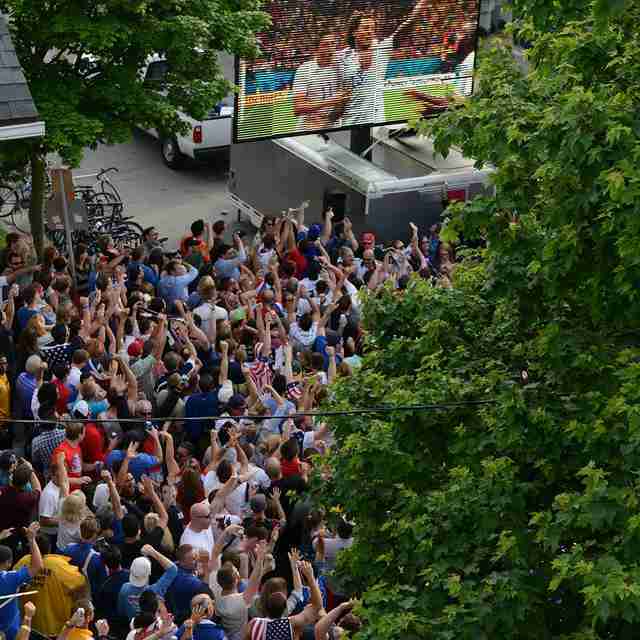 Street party on July 15 for the final with a Jumbotron screening, live entertainment, and raffles. 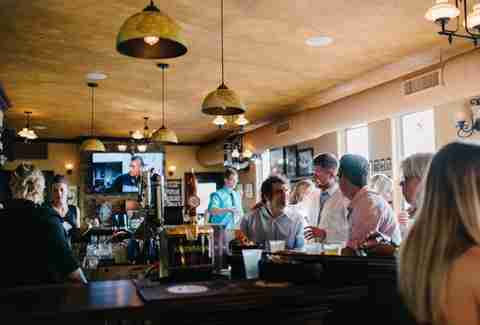 Though the space at Red Lion is long and narrow, there are enough TVs -- including a big projection screen at the end of the room -- to make sure everyone's got a good view. Early morning matches mean Bloody Marys and Guinness pints, with a short menu of bangers and eggs and chip buttys with HP sauce that’ll soak up the alcohol. And, if the World Cup inspires you to play a little footy of your own, head to the surprisingly tranquil rooftop patio and play some giant pool with soccer balls. Special: Free full English breakfast buffet on weekday mornings with the purchase of a drink; there'll also be a rooftop patio party for the final on July 15. Some places are pubs first, with soccer just a natural extension of that designation -- at The Highbury, though, soccer has always come first, and the fact that it's a pub is just a happy coincidence. There is no food, most beers are canned or bottled, and the most complicated cocktail on the menu is Crispin and Goldschlager. You'll be surrounded by other die-hard football fans in no-nonsense digs, making for one of the least touristy-feeling pubs to catch a match. 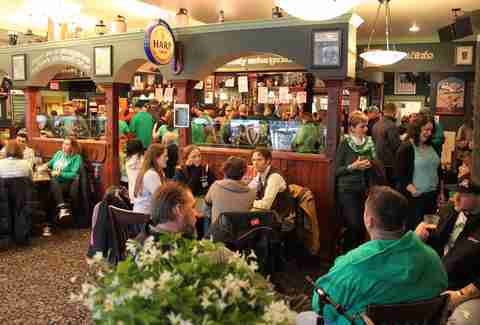 For a decidedly Irish experience, watch a few matches at McBob's: it's a neighborhood pub with a diverse, welcoming crowd, and some of the best corned beef and Reuben sandwiches in Milwaukee. If you're there on a Tuesday, Thursday, Saturday, or Sunday (the menu can get a little confusing), you can indulge in one of their infamous giant bar tacos, which truthfully eat more like burritos. If you haven't figured it out yet, this is one of your best bets to watch a World Cup match when you're starving. 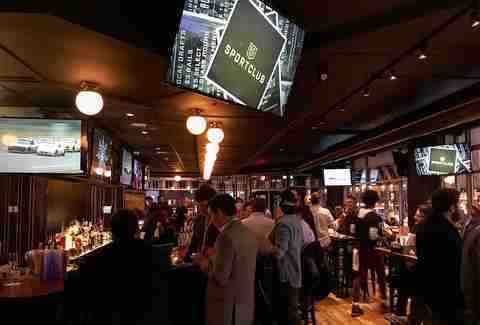 The newest sports bar in town, SportClub opened just in time for March Madness earlier this year, so there's no precedent yet set on World Cup watching. However, all signs point to this being a great spot to watch a match, especially for the more casual fan; there are TVs everywhere (naturally), and even some stadium-style seating areas in the vintage space. The match day menu is substantial as well, with items like a Korean breakfast sandwich, breakfast totchos, and spicy cheesy grits. The ultra-cozy County Clare Pub and Inn will likely be a low-key spot to take in a match. There will probably be a few people who are into the game, but it won’t be anything like the mayhem of the annual St. Patrick's Day celebration; that's perfect for the more casual fan, or anyone who’s just nursing a headache from the night before. If you’re in the latter camp, grab a fantastic Bloody Mary made with a splash of Guinness and a pickled potato garnish. Though the majority of the places we’re recommending are UK-themed pubs, Germans are not exempt from soccer mania. 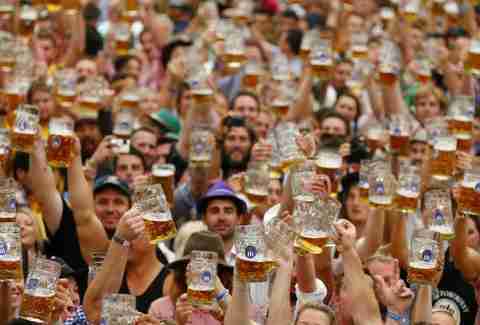 Old German Beer Hall is full of footy fans, especially those rooting for Munich-based FC Bayern, but all fans are welcome; there's plenty of Hofbrau beers on tap, served up in big glass liters just like at the beer gardens in Munich. In between matches, try your hand at Hammer-Schlagen or scarf down a currywurst. 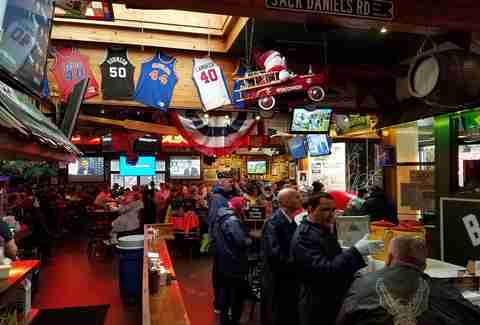 An all-around sports bar downtown, Major Goolsby's has been going strong for a long time. It's a little divey these days, but with 40+ TVs and projection screens, there's basically no spot where you won’t have at least four screens in your field of view -- and there are at least four tuners on those TVs, so you can watch multiple games and sports at once if there's a conflict. It's a no-frills kind of place, but the charbroiled burgers (of the wide and flat variety) are reliably tasty, as are the breaded wings (served sauced and sprinkled with dry seasoning).